It’s somehow comforting to know that dinosaurs are not yet extinct in the midsize segment. Tracing them back to their earliest years – whenever you think that might be – SUVs were traditionally rough and tumble beasts based on heavy-duty truck-type underpinnings. But recently, most in the midsize class have adopted car-like attributes to become “crossovers” so as to appeal to those who want the look of ruggedness without the attendant brutality. And those crossovers have exploded in popularity, virtually taking over the midsize class. But Toyota’s 4Runner isn’t one of them. Traditional truck/SUV body-on-frame construction leaves the 4Runner sitting higher than most car-based crossovers — which describes virtually every other entry in the midsize class — but some buyers like its rugged appeal. Whereas crossovers are – almost by definition – built around car-based unibody platforms (think corrugated cardboard box), SUVs were traditionally built on truck-type frames (think regular cardboard box resting on parallel 2x4s). While the former is almost invariably lighter and stiffer, the latter tends to be stronger, better able to endure the rigors of tough off-road driving. But of course, few people who own either one ever actually take them off road, making the crossover’s lighter weight (better for both performance and fuel economy) and superior space efficiency more appealing to the demands of the modern masses. The 4Runner not only sits on a frame, but also has a solid rear axle (most vehicles except pickup trucks now have independent rear suspension), a combination that’s as old as automobiles themselves. 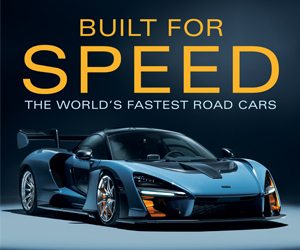 Both tend to make the ride more jiggly, as the frame can vibrate like a tuning fork over rough pavement, while the solid rear axle is not only heavy – making it harder to step over bumps – but even if only one wheel hits a bump, both wheels move in a less-than-ideal arc. But like the frame, it tends to be stronger, which can result in greater durability and increased towing capacity. Toyota covers its bet by offering two very different midsize crossover/SUVs, the former represented by the very-well-executed Highlander. Surprisingly, they’re roughly the same size, with the Highlander being two inches longer overall and two inches shorter in height. But it also has more headroom front and rear, a lot more legroom front and rear, and it weighs about 150 pounds less. The two-wheel-drive version of the Highlander has front-wheel drive, whereas the 4Runner’s has rear-wheel drive. The 4Runner makes its mark with a bit more cargo capacity and significantly more ground clearance (9.6 inches vs. 8.0), but that’s about it, as both are rated to tow up to 5000 pounds. The top-line Limited trim level of the 4Runner attempts to dress up an interior otherwise aimed at sturdiness with woodgrain trim, leather upholstery, and heated and ventilated front seats. Right: A rare feature for the class is the 4Runner’s low-range gearing with locking center differential (on 4WD versions), both useful in off-road driving or in deep sand or snow. Yet there are a couple of other things the 4Runner has going for it, though not all buyers will care. One is a 4-wheel-drive system that – unlike most crossovers (including the Highlander) – offers low-range gearing (which is great for off-roading and deep sand or snow) along with a locking center differential (ditto). The other is a drop-down rear window in the liftgate, just like station wagons of old (although in those, the window typically dropped into a flip-down tailgate). Some might find this useful for carrying long items that can be hung out the window, but we found it odd that the window could only be raised or lowered by using a button on the console. As one might expect due to its truck-based design, the 4Runner’s ride quality isn’t quite up to that of most midsize crossovers. There’s a bit more reaction to bumps, but even on our pockmarked roads here in Chicago, it was completely tolerable and never harsh. On a long highway trip, the 4Runner seemed to require more steering correction to go straight down the road (front-wheel-drive-based vehicles tend to be better in this regard), and crosswinds seemed to affect the boxy body more than in similar-sized crossovers. Powertrain performance was a bit surprising. Under the 4Runner’s hood lies a big 4.0-liter V6 rated at 270 horsepower mated to a 5-speed automatic transmission. (Highlander’s V6 is a 3.5 liter rated at 295 horsepower, and it’s tied to an 8-speed automatic.) Floor the throttle from a stop, and the 4Runner moves out fairly well, but acceleration seems to get stronger above about 30 mph – which is rather the opposite of what might be expected. The transmission downshifts quickly for more passing power, something that – based on other Toyota automatics – was exactly what might be expected. As mentioned, the 4Runner’s ground clearance is 1.6 inches higher than that of the Highlander, and the interior floor seems even higher than that would imply (blame the tall frame rails). As a result, it’s quite a step up into the interior – enough so that those under 6’, at least, will find it a bit of a climb – which may explain why our tester was outfitted with optional $1500 (!) power running boards that would be a help to shorter folks (but a hindrance to taller ones — hence the beneficial ability to power them in and out, or turn them off altogether). An unusual feature is the 4Runner’s power drop-down back window, which is lowered via a console button. Once situated, the first thing noticed is that the view out is different. The 4Runner has very upright front roof pillars – odd looking themselves in this day and age – and that pushes the leading edge of the roof forward, which creates just a bit of a “closed in” feeling. However, overall visibility is quite good, aided to the rear by back-seat headrests that fold down to clear the view. As our tester was the line-topping Limited, it included a host of high-end equipment. The leather-upholstered front seats were both heated and ventilated, and the driver’s had power lumbar adjustment and memory. 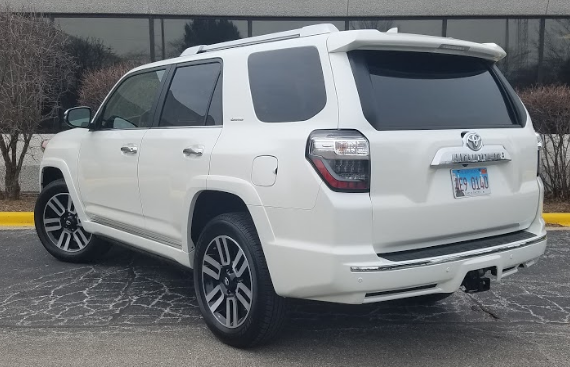 Also included were a power moonroof, dual-zone automatic climate control, and front- and rear-obstacle detection, all added to “lesser” 4Runners’ fare of heated mirrors, wiper de-icers, rearview camera with dynamic guidelines, power liftgate window, five 12-volt plugs, and a 120-volt/400-watt AC outlet in the cargo area. Oddly, the dash top was hard plastic, though padding covered the door tops and armrests, and there was some nice-looking woodgrain trim. 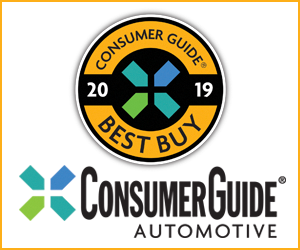 Notably absent were modern high-tech safety features such as forward collision warning and mitigation, blind-spot alert, lane-departure warning, and rear cross traffic alert. High-mounted audio controls include volume and tuning knobs along with a few physical buttons, with “virtual” station-select buttons showing up on the 6.1-inch touchscreen. Included are a navigation system, Toyota’s Entune suite of apps, and a CD player, the last an increasingly rare item. Climate controls consisted of various dials and buttons, all mounted a bit low for easiest reach. A nearly flat floor in back gives a center-seater more foot room. Note that the rear-seat headrests can be lowered for better rear visibility, and must be lowered to fold the rear seat back — after the cushion has first been flipped forward. Doing so leaves about a 2-inch step above the cargo floor that’s spanned with a ramp to ease loading of longer items. Head and leg room in front are good rather than great. Ditto in back – though even 6-footers should fit – and though a nearly flat floor benefits a center-seat occupant, smallish door openings restrict egress somewhat. And again, there’s that tall step-in to consider. A third-row seat is also optional, but our tester didn’t have it. Cabin storage is only about average for the class, and while cargo space in back is quite good, there are some areas where it lags a bit. Folding the second-row seat backs is a bit more cumbersome than in some vehicles, as the seat cushion must first be flipped forward and the headrests released and flipped down before the seat backs can be folded. And then the seat backs rest a couple of inches above the level of the cargo floor, though a ramp bridges the gap and likely allows long items to be slid forward, though not as easily as if the floor were flat. There’s also no hidden storage under the floor and the liftgate isn’t powered, though there are tie-down hooks and the aforementioned drop-down power window and 120-volt outlet, both useful (and rare) features. Although it might be thought of as a dying breed, the 4Runner sells fully half as many copies as the much-more-modern Highlander, which itself is a popular vehicle in the midsize segment. So while the 4Runner might seem outdated, there appears to remain a fairly sizable audience that still wants the sturdiness — and look — of a traditional midsize SUV. Clear the high sills, sense the heft around you, and return with us now to those thrilling days of yesteryear, when sport-utility vehicles like the 4Runner all were trucklike conveyances that married a body to a frame until rust did them part. One of the most damning things you can say about any motor vehicle these days is that it feels “old.” While we can say that about the Toyota 4Runner, we mean it in the nicest way. This throwback midsize SUV is up for more than just kid shuttling or bargain hunting because it’s not built to merely be a station wagon with a little extra ground clearance. Of course, it doesn’t exactly ride or handle like one of the many crossover utes that are so popular today, so try before you buy. There’s good, but not overwhelming, power from the 4.0-liter V6. The 4Runner will get away smartly from a stop, its 5-speed automatic transmission (yeah, just 5 speeds) will kick down quickly for an added burst when necessary, and it will cruise the highway without undue strain. Even the fuel mileage can be a little on the retro side. The 17.39 mpg this tester saw after a run of 170.4 miles composed of 41 percent city-style driving was a reminder of one reason why the lighter crossovers came into being. Passenger room is all right. There’s a slightly odd process to folding the second-row seats to increase cargo room, but the available space is big. The top-rank Limited has a nice complement of conveniences and easy-to-use controls (right down to a vintage plunger trip-odometer reset), but it’s not so overtly plush that it veers into status-symbol territory. If you’re headed down Memory Lane, and it’s muddy and rock-strewn, the 4Runner might be the thing for it. 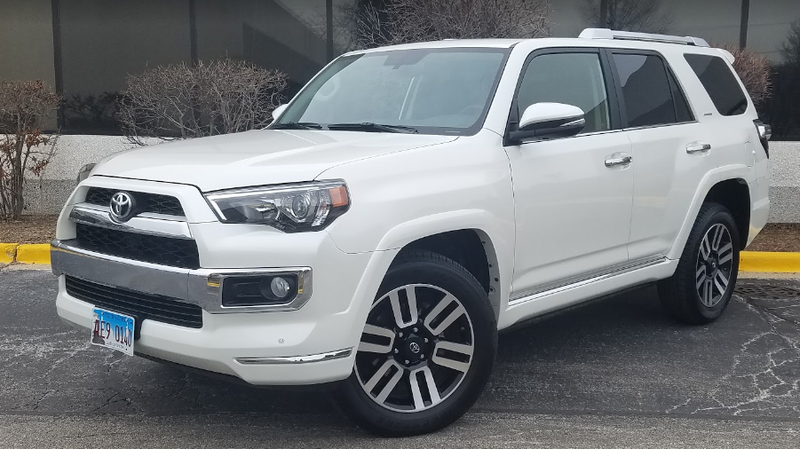 Its boxy shape and tall ride height brand the 4Runner as a traditional SUV in a sea of competitors that have largely followed the “crossover” herd. Yet it also stands out by having low-range gearing on 4WD models and a drop-down tailgate window. Written by: The Daily Drive staff on April 11, 2018.on March 22, 2019.